Editor’s Note: Welcome to the latest installment of Norms Watch, our series tracking both the flouting of democratic norms by the Trump administration and the erosion of those norms in reactions and responses by others. This is our collection of the most significant breaks with democratic traditions that occurred from February 3-February 10, 2017. Threatening judicial independence and American constitutional principles, Trump attacked a federal court judge this week in an unprecedented move which generated critique from Democrats, Republicans, and even Trump’s own nominee for the Supreme Court. After Judge James Robart, a federal judge in Seattle, blocked Trump’s immigration ban nationwide on Friday, Trump launched an attack on Judge Robart the next day, referring to him as a “so-called judge” and declaring his decision to be “ridiculous.” Trump wasn’t finished blasting the judge, and on Sunday stated that Judge Robart would be to blame “if anything bad happens.” In what became a whirlwind weekend, the Justice Department filed a notice on Saturday night that it would formally appeal the order and on Sunday morning, the U.S. Court of Appeals for the Ninth Circuit denied the Justice Department’s request to immediately restore the ban. Meanwhile, reports of immigration officials resisting or moving slowly to implement court orders regarding the ban show that Trump officials have acted in contempt of court orders, explains Just Security’s Faiza Patel. Also writing in Just Security, Ambassador (ret.) Keith Harper argues that “allowing defiance of court orders weakens the very fabric of our legal system and undermines a key attribute of good governance – the rule of law.” Jon Finer wrote that while in a democracy it is normal and can be desirable for institutions to promote different agendas, “what isn’t normal is for arguably the most powerful institution to seek not to win arguments against the others, but rather to vanquish them.” Not only carrying risks to judicial independence and constitutional principles, Trump’s inflammatory rhetoric could also incite violence or threats directed toward judges, writes Susan Hennessey for Lawfare. During NBC’s “Meet the Press” on Sunday, Vice President Mike Pence said the “president of the United States has every right to criticize the other two branches of government.” On Monday, Spicer defended Trump, saying he “utilized that power in a very legal, constitutional manner to ensure that we are safe. Our people are safe, our country are safe, our institutions are safe. And it’s somewhat sad to see a judge go rogue like this.” Within the Republican party, Trump’s attacks sparked criticism from Sen. Ben Sasse (R-Neb. ), and Senate Majority Leader Mitch McConnell (R-KY.) said it was “best to avoid criticizing judges individually.” Other Republicans, however, are standing behind Trump and not coming to Robart’s defense. In a unanimous decision delivered on Thursday night, a panel of three federal judges refused to reinstate Trump’s travel ban. Trump’s order is now most likely headed for the Supreme Court on appeal. His response is below. Does it look familiar? Trump’s Nominee for Supreme Court: A Rubber Stamp? On Wednesday, Sen. Richard Blumenthal (D-Conn.) revealed that during a private conversation, Judge Neil Gorsuch, Trump’s nominee for the Supreme Court, said that Trump’s attacks on the judiciary are “demoralizing” and “disheartening.” Early Thursday morning, Trump launched a personal attack on Blumenthal’s record, and said that Blumenthal had misinterpreted Judge Gorsuch’s comments. 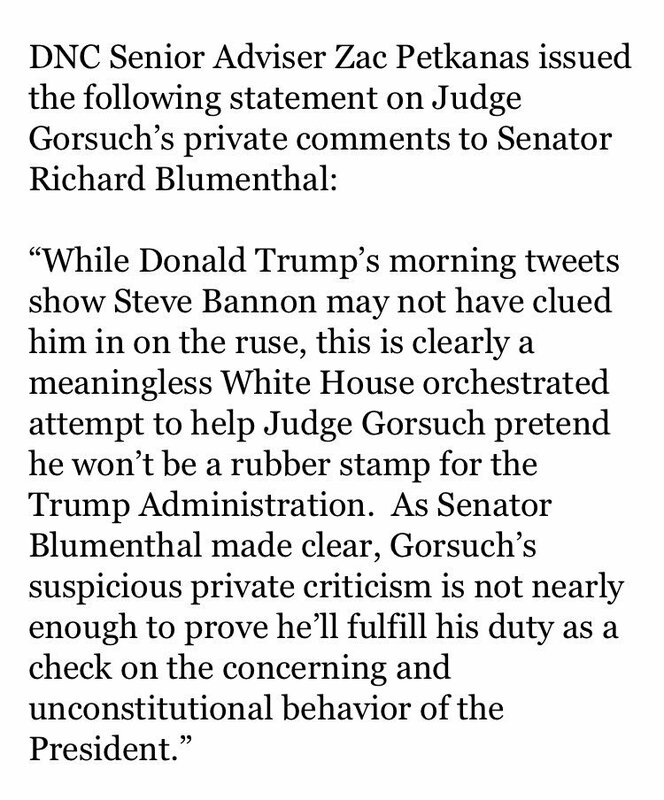 Shortly after, the Washington Post confirmed Blumenthal’s account with Ron Bonjean, a member of the group directing Gorsuch through his confirmation process. On Thursday afternoon, Blumenthal said that Gorsuch had encouraged him to go public, saying, “You can repeat that. You can quote me.” The leaked conversation is now raising questions if the comments were actually planned to ease Gorsuch’s nomination. Journalists debated the possibility over social media, and Zac Petkanas, a senior adviser with the DNC, issued the following statement: “This is clearly a meaningless White House attempt to help Judge Gorsuch pretend he won’t be a rubber stamp on Trump’s administration.” Sen. Joe Manchin (D-W.V.) said it was cynical to view the remarks as planned in any way, and Gorsuch’s comments just show he “is very protective of the judicial process and system, and he’s very endeared to it.” Interestingly, Manchin was the sole Democrat to vote for Jeff Sessions, Trump’s nominee for Attorney General. At midnight on Monday, an “unusually broad coalition of large and small tech” businesses, including more than 130 companies, filed an amicus brief urging the U.S. Court of Appeals for the Ninth Circuit to decline the Justice Department’s request to reinstate Trump’s executive order on immigration. The brief, signed by Apple, Facebook, Microsoft, Google, Tesla, Uber, Intel and others, argues that Trump’s order “violates the immigration laws and the Constitution.” With high-tech going “full-tilt political,” corporate resistance to Trump’s policies “is in many ways uncharted territory for American companies and they are faced with some very difficult choices,” Harvard Business School professor Nancy F. Koehn told POLITICO. Jumping on the amicus trend, 18 Democratic attorneys general filed a brief in support of Washington state’s case against Trump’s ban. The New York Times reported that the order was a “galvanizing first challenge for a gang of Democratic attorneys general who have vowed to check the power of the White House.” To keep track of the lawsuits filed by a number of states, Just Security’s Marty Lederman provides an overview. This week, the ubiquity of Trump’s business ties became fully apparent, and entanglements between the Trump White House and the Trump Organization seem unavoidable. The activities of Trump, his wife Melania, and children Ivanka and Eric over the last few days illuminated how the Trump team’s business arrangements are allowing the family to profit from its public position. After Nordstrom announced on Feb. 2 it was dropping Ivanka Trump’s label due to product performance, Trump lashed out on Wednesday against the retailer on Twitter, blurring the line between the White House and the Trump business organization, according to CNBC. The official POTUS twitter account retweeted Trump’s personal attack on Nordstrom later on Wednesday. Richard Painter, the chief ethics lawyer under President George W. Bush, wrote that Trump’s Nordstrom tweet was an “act of intimidation,” and that the president was using his position to promote his own family’s companies, and to retaliate against others. While Nordstrom insists that the decision was entirely based on product sales, on Wednesday, Spicer argued that Nordstrom’s action was a “direct attack” on Trump’s policies, and that Trump should be able to defend her as her father. Spicer stated, “For people to take out their concerns about his actions or his executive orders on members of his family, he has every right to stand up for his family and applaud their businesses activities, their success.” When asked if Nordstrom’s decision would have any impact on Ivanka given her pledge to resign from the family business (though whether she actually resigned remains in question), Spicer said the action damaged her brand and her name. In the Trump era, retailers are suddenly in a precarious situation. The Nordstrom incident comes in the midst of the trending #GrabYourWallet campaign, created by Trump critics emboldening shoppers to boycott products with links to Trump and members of his family. Some retailers, like T.J. Maxx, have chosen to minimize the visibility of Trump products in stores. Siding with critics, however, won’t necessarily solve retailers’ problems; following Trump’s tweet about Nordstrom, his supporters launched a new campaign of #BoycottNordstrom tweets. The complaint therefore suggests that Melania intended to profit from her position as first lady. Jordan Libowitz, communications director for the watchdog group Citizens for Responsibility and Ethics (CREW), told the Washington Post that “we’ve never had to deal with issues like the first lady trying to monetize her position.” Richard Painter, former ethics adviser to President George W. Bush, said the language of the lawsuit demonstrated that Melania’s activities are “an unprecedented, clear breach of rules about using her government position for private gain.” More troubling, as of Tuesday, Melania was still listed in New York filings as CEO of Melania Marks Accessories Corp and Melania Marks Accessories LLC, the companies overseeing the royalty payments from her from “Melania” branded products, according to the Associated Press. Others have said that Melania’s activities are nothing new, and that an unspoken truth is that “ first ladies know that inherent to the role is the power to sell.” On Tuesday, representatives of the first lady insisted that she “has no intention” of using her public position for personal gain and profit. According to the Financial Times, Japanese Prime Minister Shinzo Abe has been planning to offer Trump a “tweetable” snapshot of the amount of money Japan has invested in the U.S. during their upcoming meeting this week. The story reported that Abe had requested investment numbers from three major Japanese companies, and he was also relying on public investor institutions to pledge billions of dollars toward infrastructure projects in the U.S. Abe’s “extraordinary effort to bring gifts highlights his determination to forge a personal bond with the US president,” the article explained. Who’s Paying for Abe’s Stay at Mar-a-Lago? Abe’s visit also includes a scheduled round of golf with Trump and a stay at the Mar-a-Lago resort, owned by the Trump Organization, raising potential conflicts of interests concerns. As of Wednesday, it was unclear who would be paying for Abe’s stay at the resort—taxpayers could front the bill, Abe could pay for the visit, or the money could be given to the Treasury Department as part of Trump’s ethics plan announced on Jan. 11. WH list of “non-covered” terror attacks is a ham-handed, misspelled diversion. #bydesign News orgs covered attacks/spelled them correctly. After just three weeks in office, the Trump administration has settled into a routine of regular attacks on the New York Times. On Monday, Spicer stated that the paper owed Trump an apology in reference to the Times’ stunning Sunday night article “Trump and Staff Rethink Tactics After Stumbles.” True to form, Trump lambasted the “failing” paper as fake news. Released on Sunday, a CNN/ORC poll reported that 53% of Americans oppose Trump’s executive order on immigration. On early Monday morning, CNN’s Brian Stelter tweeted about the poll results, and just thirty minutes later, Trump responded by denouncing any negative polls as fake news. This week the American public got a peek inside the inner workings of the (apparently dimly-lit) White House, thanks to a stream of unprecedented leaks from the administration. As reported by the New York Times, Trump was not fully briefed on the executive order giving Steve Bannon, chief strategist, a seat on the National Security Council. The article depicted a scene where aides work in the dark, uncertain of how to turn on the light switches in the cabinet room. According to the story, Bannon works 16-hour days in a “darkened, mostly empty West Wing.” Trump later refuted the article on Twitter, and Spicer stated on Monday that Trump had been “briefed on all aspects” on the executive order. The White House has stopped counting new signatures on petitions posted to its website (including one Just Security helped circulate, #RemoveBannon), has shut down its comment phone line, and has stopped publishing all transcripts, executive orders, and news releases online, writes Anita Kumar. The comment line recording now directs the public to send a message through the White House website, or through Facebook messenger, which the White House does not currently use. Robert Weissman, president of the ethics group Public Citizen, told McClatchy, “We have a president contemptuous of democracy… . I think the totality of measures you are describing are reflective of a president and administration who are uninterested in public input.” Others have cautioned that it is too early for alarm bells, as the administration could be prioritizing resources elsewhere during transition. On Tuesday, Vice President Mike Pence made history when he cast the tie-breaking vote in a 50-50 Senate deadlock to confirm Trump’s nominee for Education Secretary Betsy DeVos. Pence’s vote was the first time in U.S. history that a vice president needed to vote to resolve a tie on a cabinet nomination, reported the New York Times. The degree of opposition to DeVos, a billionaire and vocal advocate for school choice, “is unprecedented for education secretary nominees, who usually sail through the Senate confirmation process with little pushback,” writes Libby Nelson. Sparring on Tuesday night with CNN’s Jake Tapper, Conway defended Trump’s claims by stating the murder rate had increased between 2014 and 2015. In response to pushback from Tapper that this was not evidence to support Trump’s 47-year high claim, Conway said maybe Trump was referring to numbers for a particular area, and that she wasn’t sure who gave Trump his data. For a full video of Conway’s response, see here. During an interview on Feb. 2 with MSNBC’s Chris Matthews, Trump aide Kellyanne Conway, defending Trump’s travel ban, stated, “Two Iraqis came here to this country, were radicalized, and they were the masterminds behind the Bowling Green massacre.” Insisting that she made an “honest mistake” by referring to an event that never happened, Conway later said she had meant to say “Bowling Green terrorists.” On Monday, however, Cosmopolitan magazine reported that it was not the first time she had used the same wording, referring to the “Bowling Green massacre” during an interview on Jan. 29. Further undermining her claim that this was an off-the cuff mistake, Conway also used the wording “Bowling Green attack” during an interview with TMZ on Jan. 29, reported Gideon Resnick. Moreover, when Cosmopolitan asked for a comment from Conway on Feb. 3, and again on Feb. 5, Conway continued to push the false story of two men plotting a domestic terrorist attack. As the Defense Department looks to rent property in Trump Tower, conflicts of interests are stretching into the domain of national security. Over the last few days, elected officials at home and abroad are offering subtle, and not-so-subtle, statements on Trump’s policies. First reported by CNN on Tuesday night, Lt. Col. JB Brindle, a spokesman for the Pentagon, announced the Defense Department was seeking to lease limited property space in Trump Tower. Brindle stated, “The space is necessary for the personnel and equipment who will support the POTUS at his residence in the building.” A leasing agent from Trump Tower, which is owned by the Trump Organization, told CNN that the rent for an available floor in the building is around $1.5 million a year. Based on a November estimate from the New York Post, the lease held by the Secret Service in Trump Towers could also be costing taxpayers up to $3 million a year, and a significant amount of that rent payment heads to the pockets of the Trump Organization. The Defense Department’s move “could directly funnel government money into the president’s business interests,” according to the Washington Post. While it is not unusual for Defense officials to make such security arrangements, including a similar arrangement for Obama’s Chicago home, in this scenario, a government agency is a tenant, paying rent to a company owned by the president, only adding fuel to the ethics firestorm this week. First reported late Thursday night by the Washington Post, Michael Flynn, Trump’s national security adviser, discussed U.S. sanctions against Russia with Sergey I. Kislyak, Russian ambassador to the U.S., weeks before Trump assumed office. Accounts from current and former officials indicate that Flynn’s phone communications could raise legal questions, and are at odds with statements from Trump advisers, who have denied sanctions were ever discussed. The law in this area is “murky,” according to the New York Times, and Fynn’s conversations are more likely to lead to further investigation rather than official charges. FBI officials are continuing to investigate this week. However, the cover-up may be worse than the crime, writes Just Security’s Ryan Goodman, discussing the implications of the story’s “potentially even more explosive revelation” about contacts between members of Trump’s team and Russia during the campaign. When Bill O’Reilly referred to Russian President Vladimir Putin as “a killer” on Sunday night, Trump responded: “There are a lot of killers. We’ve got a lot of killers. What do you think? Our country’s so innocent?” Senate Majority Leader Mitch McConnell (R-KY.) tried to offer a tempered critique of Trump’s comments, stating he didn’t “think there’s any equivalency between the way the Russians conduct themselves and the way the United States does.” Other Republicans including Sen. Marco Rubio (R-Fla.) and Sen. Ben Sasse (R-Neb.) were more vocal in their rebuke of Trump’s statements. On Monday, kicking off his first speech to U.S. Central Command and U.S. Special Operations Command leadership at MacDill Air Force Base in Florida, Trump remarked, “We had a wonderful election, didn’t we? And I saw those numbers, and you like me and I like you, that’s the way it works.” Trump seems to have no qualms about imposing his politics on historically apolitical agencies, as the remarks echoed Trump’s earlier speech to the CIA on Jan. 22. Announced on Friday by Bloomberg, Army Secretary Nominee Vincent Viola withdrew his name for the position, citing the difficulty of severing his business ties to federal contracts. In an unprecedented act of politics, Speaker of the House of Commons John Bercow stated on Monday that Trump was unfit to address members of parliament (MPs) because of parliament’s opposition “to racism and to sexism.” Despite the thunderous applause in the Chamber, Bercow’s comments have been criticized by the government and other politicians for being “hugely political and out of line.” For more details, see the Guardian report. Responsive Norm: Rebuttal to Trump’s Australia Call? On Monday, two Democratic and two Republican senators introduced a bipartisan resolution to reaffirm U.S. commitment to the U.S.-Australian relationship. While not a norms violation, the act does suggest an unusual rebuttal to Trump’s phone call with Australian Prime Minister Malcolm Turnbull last week.